In February 2012, KBAQ commemorated Arizona’s centennial with a collection of stories representing the last one hundred years of the state’s arts and cultural history. “Hearing the Century: Voices of Arizona’s Arts Past and Present,” highlighted just a few of the amazing individuals who call, and have called, Arizona home. The twenty-one segments focused on the unique styles and contributions of Arizona artists in music, theater, painting and other art forms– from north, central and southern parts of the state. These segments, just a fraction of the many stories embedded in Arizona’s beautiful landscape, are now archived for public reference and knowledge. We hope our listeners are inspired by these stories- just as we are. Hearing the Century is KBAQ’s gift to the great state of Arizona in celebration of 100 years of statehood. 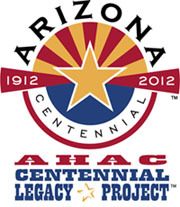 This project has been recognized with Legacy Status by the Arizona Historical Advisory Commission. KBAQ’s Hearing the Century is made possible in part by support from the Arizona Humanities Council and by in-kind support from South Mountain Community College. KBAQ is a listener-supported public radio station licensed to the Maricopa Community College District as a community service of Rio Salado College’s Division of Public Service, which also includes KJZZ 91.5, Sun Sounds of Arizona and MCTV. KBAQ is the Valley’s only classical music station dedicated to sharing information about arts and cultural events—serving more than 160,000 weekly listeners. It is available 24-hours a day on 89.5 FM and HD and online via streaming audio on kbaq.org.